It’s a term commonly thrown around now by supervisors and bosses and CEOs, but never by employees themselves. Ironic, isn’t it? These days, to sell their companies, higher-ups claim that their employees are happy – no, no, it’s not like they’re lying or anything. They just genuinely believe their own employees are happy. Why wouldn’t they be? They work in an air-conditioned office. They have a one hour lunch break. They must have great camaraderie with the people they work with everyday. And, come on, the pay isn’t all that bad! What’s there to complain about? Of course our employees are happy! Yet, surveys conducted this year shows that a staggering 61% of employees surveyed said they’d thought of looking for employment elsewhere. There you have it, folks – that’s your “employee happiness”. Those companies technically aren’t wrong when they say their employees are happy. Their employees could be happy. They could be smiling and laughing and having the time of their life while working. But is it enough? There’s discussion these days that, no, it isn’t. It isn’t enough to keep your employees happy. After all, they could be equally as happy going out with friends or staying at home to play video games. Happiness is so easily attainable these days that the workplace needs to offer more than just that. “But the workplace does offer more! They pay you!” you say. But is that what it’s come down to? Money? Is money enough, then? Studies have shown that, no, it isn’t. That old saying that everyone loves quoting: “money can’t buy happiness”? Apparently, it’s true. While everyone loves money and the things it can provide for us, it simply isn’t enough. Even pay raises have proven to be futile attempts in the quest to make employees want to keep working. Money is probably more effective than “employee happiness” but it still isn’t working as effectively as we want. So, what is the problem here? They’re happy, they’re getting paid, but employees still think about leaving their jobs all the time. Happiness and money is all fine and dandy, but the real selling point of a good company is engagement. Employee happiness and employee engagement often get mixed up, and, even when the distinction is clear, it is unclear which should take priority. So how about this radical notion of combining both, where employees live and breathe their work, and derive enjoyment from it? Here’s how we think we can achieve this. We’re woking with these people day-in and day-out. Much better to have somene to talk to when you’re tackling that pesky assignment, you know? No one wants to work while they’re sweaty or sleepy. A good working environment provides employees with just the right amount of comfort to keep them motivated. It’s the really small things that matter. Small things like having a monthly gathering with colleagues to play games, or someone getting coffee for everybody when there’s a super-early meeting. Little surprises go a long way in keeping employees happy. Enough sleep, regular meals. Do your employees have the energy to do their work? Are they struggling to meet deadlines with half-opened eyes? Are they starting to get cranky and irritated because all they want to do is to sleep, but they have work to do? Always encourage your employees to take ample rest. Give them time to have ample rest; how about starting work later? That’s what employee happiness, to me, a working adult, is all about. But what of employee engagement? Do you feel that pride and sense of achievement when you work? Do you feel like you’re doing something worthwhile? Here’re some of the things we think are necessary to achieve all that. Simply put, we’ve gotta love what we do. We’ve gotta want to do what we’re doing. No one wants to force themselves to do something they don’t truly believe in. Thankfully, passion can be cultivated. It requires some educating and some interaction and some time, but passion for work can be cultivated. Say “thank you”! Say “you’ll do better next time”! Say “you’re getting there”! We employees need and want to know how we’re getting along. We need to know what we can improve on, and what accomplishments we’re actually achieving, if we’re achieving any. This keeps us engaged and interested, both in our own progress and the company’s. Does my work help me as an individual? Or am I simply giving my time and life away to the company, but getting nothing besides monetary gains in return? We’ve already established that while money is a good pull, it’s not a good foundation for employees to base their happiness or engagement on. The workplace needs to be able to shape their employees, and help their employees learn and grow in their personal lives. 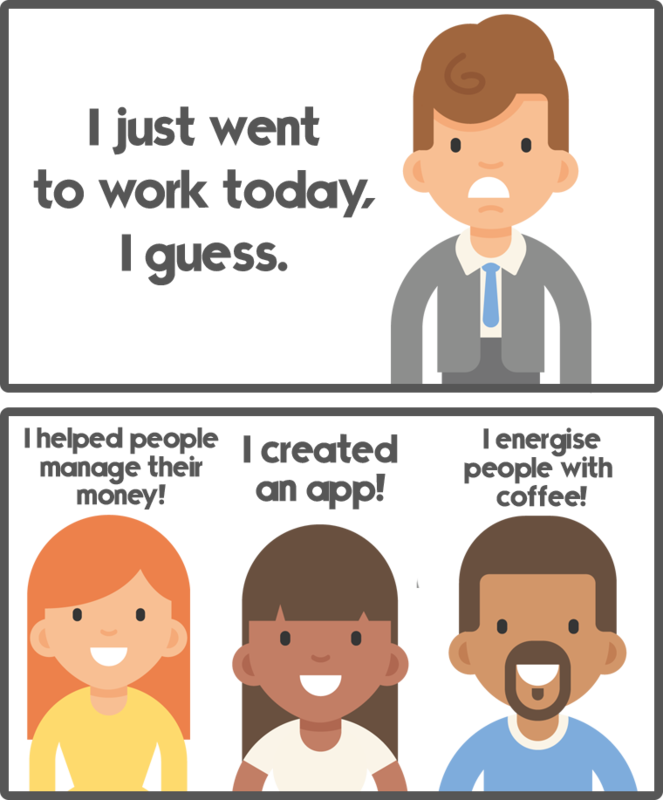 Employee happiness and engagement boils down to this: Do I want to tell other people what I did at work today? Am I excited about what I did at work today? Yes, it’s true that work is just one aspect in our lives, and, who knows, maybe we are putting too much thought into it. Maybe we’re meant to grumble and hate work, but then go back to a loving home where everything is alright. Maybe we’re not meant to love our work. Maybe that’s okay. After all, work isn’t everything, is it? But why should we suffer, if we don’t have to? Why should we hate our work if we can love it? Yes, there is much more to life than work. But work can also be so much more if we put some life into it.